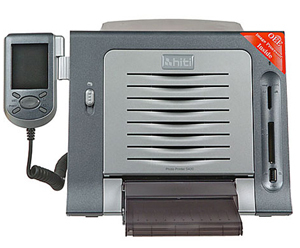 The HiTi 420 (S420) Passport Photo Printer has a color LCD controller, with multi-language and graphical user interface that allows users to edit images easily without the need of a computer. HiTi S420 has LinkPrintTM technology offering a functional connection interface between the printer and various storage devices including flash memory cards, digital cameras, USB drives, and many other USB devices.With a wide range of embedded ID format selection, HiTi S420 offers you a total solution for all your ID photo printing needs. In addition, a free bundled software, IDesiree 2.0, gives you unbeatable flexibility in ID format designs to satisfy the ID photo market demand worldwide. HiTi S420 has LinkPrintTM technology offering a functional connection interface between the printer and various storage devices including flash memory cards, digital cameras, USB drives, and many other USB devices. With a wide range of embedded ID format selection, HiTi S420 offers you a total solution for all your ID photo printing needs. In addition, a free bundled software, IDesiree 2.0, gives you unbeatable flexibility in ID format designs to satisfy the ID photo market demand worldwide. * Accessible embedded ID formats may vary from region to region. To ensure highest print quality, the dust-proof hatch door opens and closes automatically during the printing process, preventing dust from entering the printer. In addition, a protective cover over the paper cassette and an optional detachable rear dust shield further enhance dust resistance capability, ensuring beautiful and dust-free prints every time. Utilized HiTi Classic ColorTM technology, HiTi Digital Photo Printer have won 4-time DIMA shoot-out awards in 5 years for their outstanding quality and exceptional performance. HiTi's dedicated color ribbons come with exclusive Magic Coating technology. The Magic Coating technology lays a protective and transparent coating layer over the photo once the color sublimation process is complete. HiTi's Magic Coating is water, UV-ray, fingerprint and smear resistant. This Magic Coating technology also provides an optional watermark function, which can be customized to personalize photos or used as a counterfeit protection. HiTi photo printer S series use the exclusive new generation dye-sublimation consumables for improved color reproduction, image quality, and faster printing speed. New color ribbon formula advances the color characteristics, and the new photo paper base enhances the image brightness. A transparent resin layer (Magic Coating) protects the photo against water, UV-ray, fingerprint, smear, oxidization, and color fading. To ensure highest print quality, HiTi offers a 10,000 prints/1 year limited warranty for HiTi photo printer S series. For more and complete warranty information, please refer to the warranty card for details. Warranty: 12 Month HiTi Warranty from the date of import (invoice date) or If nothing provide the warranty will be 12 month , judged by the Printer Serial Number: Any physical damage and warranty sticker broken will be regarded as out-of-warranty. Passport Cutter, 50mm x 50mm, for Passport Photo Systems. The HiTi 4x6 Photo Pack for the S420 SnapShot printer is the exclusive new generation dye-sublimation consumables, is designed to work perfectly with HiTi Photo Printer S Series. The color ribbon formula advances the color characteristics and the photo paper base enhances the image brightness. A transparent resin layer (Magic Coating) protects the photo against water, UV-ray, fingerprint, smear, oxidization and color fading. We at Foto Club know customer support is a huge part of the satisfaction of our customer's experience with the products we sell. We focus heavily in this area to make sure that we have friendly, qualified English and Spanish speaking technicians to assist you. Along with the training that we also provide for this "Fun Photo System" we also make sure that we have tools in place to expedite information and training (Teamviewer via online interaction) so that we may provide you with correct information to resolve any issues quickly and effectively. HiTi 50 Photo Pack 4"x6" photo paper for the S420, S400 printers. Total of 50 prints. 12 x Packages of 4 x 6" Sheets of Photo Paper (1 Ribbon and 50 Sheets per Pack) (Total of 600 Prints) For use with the HiTi S420 or S400 printers. Please how much is this? I love it.